Hey, sweet friends! I hope you are having a very lovely Wednesday! 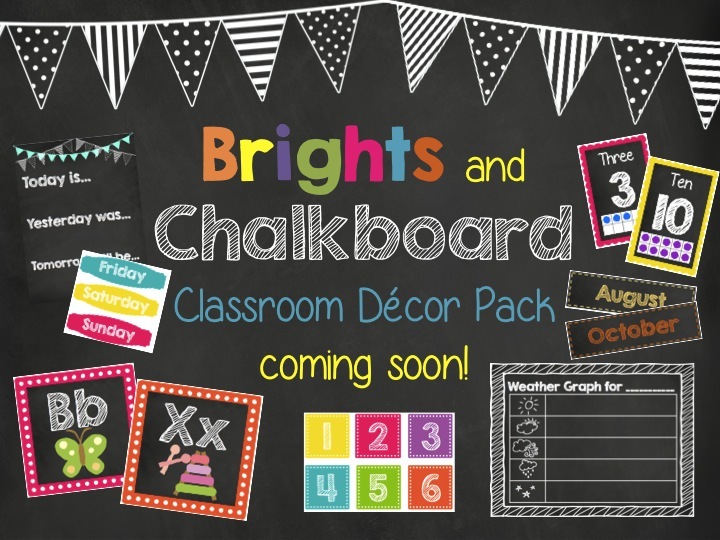 I wanted to throw out a little preview of the classroom decor pack I am working on. I'm currently loving the whole chalkboard thing. So cute! However, I'm not a fan of everything in the room being black, so we are pairing it up with some beautiful brights. The pack will have calendar materials, alphabet/number/shape/color posters, word wall headers, objective posters, supply labels, you name it! This week has been full of good things (aside from all the chocolate, I mean). My school is hosting a reading summer school for struggling first graders moving on to second grade. It has been such a joy to work with these struggling readers and get to know their sweet strengths and personalities. I am so grateful for the little teaching moments that make it all worthwhile. I am so grateful for teachers! How lucky we are! And please allow me one last totally unrelated thing...because I'm obsessed with this awesome video....though not quite as much as I am with those Lindt Lindor choclat......oh never mind, you get it.